Enjoy this new episode of Dr. Diane Hamilton’s Take the Lead podcast, featuring Kevin Cashman. Click on the photo below to visit the podcast website. Guest Post by Kevin Cashman, originally posted on JulieWinkleGiulioni.com on November 29, 2017. I’ve been a fan of Kevin Cashman since first reading The Pause Principle nearly five years ago and have followed his work since. Kevin is a leadership luminary and Korn Ferry’s Global Leader of CEO & Executive Development. His most recent effort Leadership from the Inside Out: Becoming a Leader for Life, Third Edition, is an exploration of eight powerful ‘mastery areas’ that will support leaders at all levels of the organization. I’m delighted host this guest post from Kevin! Leadership is more than a job. It is a sacred calling with sacred responsibility. That calling is best honored when a leader sets the highest example of personal and professional behavior and then enlists others to take this challenging path as well. To accomplish both these tasks nothing is more vital than coaching. Effective coaching to bring out the strengths and talents of all the people in the group or organization, serves a dual role. It is a generous contribution to each individual’s growth and fulfillment. At the same time, it is one of the most practical strategies for maximizing the effectiveness and success of the group. The more capable and fully developed each individual in your group, the stronger the group. By Kevin Cashman; originally posted on Thrive Global on November 27, 2017. Developing resilience is not a static, rigid process; it is a type of centered fluidity that lets us go in any direction with ease and agility. Being resilient means we can recover our balance even in the midst of action. Separating our career, personal, family, emotional, and spiritual lives into distinct pieces and then trying to balance the parts on a scale is impossible. Managing the entire dynamic is the key. We need to identify the dynamics that run through all the pieces and then influence our resilience at that level. Mastery of Resilience is about practicing inner and outer behaviors that keep us grounded and centered so we can deal with all the dynamics outside. As we build more resilience, we can do more with ease. Actually, when we are resilient, we can shoulder more weight with less effort, because we are strong at our very core. We have a strong foundation to handle unforeseen crises, instead of the anxiety and constant fear that one more unexpected problem will take us down. Finding ways to build that resilient foundation from the inside out is the key to Resilience Mastery. By Christina DesMarais; originally posted on Inc.com on November 25, 2017. Stress is a subjective thing. If two people are stressed the same way, one may collapse and the other may thrive on the challenge. So, if you want to be someone who’s strong and resilient, you need to be intentional with your thoughts and how you process what’s happening. That’s according to Kevin Cashman, author of Leadership from the Inside Out: Becoming a Leader for Life. Here are his words on three simple questions to help you handle stress with dignity. 1. What can I control in this situation? When managing stress, control is best applied in our self-management versus trying to manage others. This involves deeper awareness of our responses to stress, especially to any reactive behaviors that don’t improve the situation (or that actually make things worse). You can’t control circumstances, but you can control how you respond to them. Taking charge of our well-being practices–fitness, self-care, sleep, diet, and meditation practices to build resilience is an important aspect of maintaining self-management during stress. When it comes to stress, it is best to control oneself to influence others. 2. What can I do to influence this situation? There is a difference between control and influence. You can’t control the circumstances or people surrounding a stressful situation, but you can influence them. Influence is the language of emotional intelligence. It converts stressful, potentially volatile situations into opportunities for growth and collective aspiration. However, to be effective and not controlling, your influence must be both authentic and highly relevant and important to others. Take Jim, a crusty “old-school” executive, who was extremely bright and, for the most part, got exceptional results. But when stress was high and he was responsible for navigating the team through the chaos, he “bored holes” right through people. During coaching we discovered that he didn’t mean to have such a negative impact on people. He just didn’t know any other way. He was reacting as a string of role models around him had. It turns out that, despite his behavior, he was a thoughtful, caring, and character-driven person. He just needed to find congruence between who he was on the inside with the results-oriented, intelligent leader he was on the outside. Once he started living the authentic change, he and his team were more effective. 3. What do I have to accept here? If control and influence are not generating the impact we hoped for, then we have to step back to discern and accept something that may be within or outside of ourselves. For most professionals this is the most challenging stress reliever because it goes counter to our ambitious action-orientation. When we sometimes admit that investing additional energy, time and other resources will not create an acceptable return, it frees us up to use all those resources to create new value-creating visions. Distress is usually the by-product of wasting energy by trying to control things we can only influence or accept, or accepting things we could influence or control. Take action on what you can control or influence, and more clearly face what you have to accept. Originally published to Korn Ferry Institute on September 24, 2017. 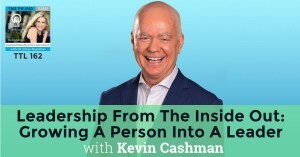 In his book, “Leadership from the Inside Out: Becoming a Leader in Life,” Senior Client Partner Kevin Cashman writes about how you have to grow yourself as a person in order to grow yourself as a leader. In this excerpt, Cashman explains how to use stories to inspire action. Stories elevate the mind and the heart to go beyond what is, to mobilize us and others to reach new possibilities. Annette Simmons, group process consultant, understood this dynamic when she wrote, “People do not want information. They are up to their eyeballs in information. They want faith—faith in you, your goals, your success, in the story you tell.” Science has demonstrated that stories, especially stories that sustain our attention with a narrative arc and some tension, have the unique force to move us intellectually and emotionally at the same time. In “Why Your Brain Loves Good Storytelling,” Harvard Business Review, scientist Paul Zak explains that his lab discovered more than a decade ago that the neurochemical oxytocin is necessary for humans to feel safe. Zak says, “It does this by enhancing a sense of empathy.” Our brain produces more of it each time we experience kindness and trust. Do You Have Leadership Character Or Coping Character? By Kevin Cashman, originally printed in BOSS Magazine, November 2017 issue. Leadership styles are abundant and there subtle differences between a great leader and a toxic one. There is also a balance that must be constantly maintained between a myriad of variables and personalities. Leading from a place of adventure rather than a place of fear has been the differentiator for many successful companies. Leadership character defines the bold leader and works to set an example of culture and beliefs. Leadership character works to transform and open up possibilities and potential. When we are leading from character, we exude qualities of authenticity, courage, purpose, openness, trust, congruence, compassion, and service. We have the ability to transform circumstances, open up possibilities, and create lasting value for ourselves and for others. The character-driven leader tends to emphasize service over self. Coping protects us and helps us get through challenging circumstances. In this sense, it has value, and if used sparingly and appropriately, will serve very specific needs. Coping works like a muscle. We need to use it at times, but if we overuse it, the muscle will collapse. Openness is so important to leadership that maybe we should stop calling people “leaders” and rename the most effective ones “openers.” Leaders open up or shut down opportunities in direct proportion to how open or shut down they are to themselves and to others. We worked with a senior executive a while ago who sincerely believed in openness. What he didn’t realize was that his way of being direct and frank with people was actually shutting them down. He believed in openness and authenticity, but his approach was creating the opposite effect. It was a total mystery to him. He even rationalized it by saying that other people in his organization just weren’t as open. What was missing was openness to himself. He could be open and direct when it came to driving people to results or expressing criticism, but he could not be open about his fears, limitations, inadequacies, or vulnerabilities. As a result, his embodiment of “openness” was very limited. One of the most effective ways to take this journey to a more integrated, authentic understanding of ourselves is to explore our personal belief systems. Few psychological dynamics are as fundamental as our beliefs. Beliefs literally create our reality; they are the lenses or filters through which we interpret the world. Some of these lenses focus on new horizons; others dim our view and limit possibilities. Beliefs are transformational. Every belief we have transforms our life in either an enriching or limiting way. As Bruce Lipton wrote in The Biology of Belief, “Our beliefs control our bodies, our minds and our lives.” In a sense, beliefs are the software of leadership, our deeply personal operating system that runs the show on the surface. One of the most dramatic examples of the transformational power of beliefs comes from heavyweight fighter George Foreman. In the 1970s, Foreman was renowned for being one of the toughest, nastiest human beings on the planet. Angry and antisocial, he often came across as a mean, uncommunicative person—not at all the person you see today. He was not known for social graces, self-awareness or his big smile. However, immediately following his surprising loss to Jimmy Young in Puerto Rico, George went to his dressing room, laid down on the training table, and reportedly had an overwhelming spiritual experience. After that experience, George changed. He changed his entire life, everything: his personality, his relationships and his life purpose. He transformed them. George peeled the onion of his personality, and the delightful, humorous, self-effacing George came forward. The important thing to note here is not whether George Foreman actually had a spiritual revelation. Many medical professionals say he suffered from severe heat exhaustion, and that’s what caused his experience. That’s not the point. The key principle is that George Foreman believed that he had a spiritual transformation, and that belief changed his life. What we believe, we become. Through years of coaching people, we have consistently observed two distinct types of belief systems operating in people: Conscious Beliefs and Shadow Beliefs. Conscious Beliefs are the explicit, known beliefs we have. When asked what our beliefs are about ourselves, about other people or about life in general, we can articulate many of them. Although it might take some effort to access and clarify some of these beliefs, they are accessible to us on an everyday level. By Kevin Cashman; originally posted on ChiefExecutive.net on October 26, 2017.